It's easy to think of plants as passive features of their environments, doing as the land prescribes, serving as a backdrop to the bustling animal kingdom. But what if the ecosystems of the world take their various forms because plant "decisions" make them that way? A new theory presented by Princeton University researchers in the journal Nature Plants suggests that in some cases that may be exactly what happens. In one of the first global theories of land-biome evolution, the researchers write that plants may actively behave in ways that not only benefit themselves but also determine the productivity and composition of their environs. "Our theory explains biomes based on the new idea that we must consider plants to be smart and strategic," said senior author Lars Hedin, a Princeton professor of ecology and evolutionary biology and department chair. "This is a global theory that explains why biomes differ in nutrient conditions and in their abilities to respond to disturbances and to absorb carbon dioxide from the atmosphere." The researchers developed their theory to solve a longstanding mystery in ecology of why trees that can produce their own fertilizer from atmospheric nitrogen grow where they do—they thrive where scientists suppose they shouldn't, and struggle in seemingly ideal conditions. These plants, known as "nitrogen fixers," use secretions to invite soil bacteria known as rhizobia to infect their roots cells. In exchange for carbohydrates that the plant produces by photosynthesis, rhizobia convert nitrogen in the air into the fertilizer form plants need, with excess nitrogen from the host plant eventually creating a nitrogen cycle that benefits neighboring trees. The majority of nitrogen fixers occur in the diverse legume family that includes beans and peas as well as trees. Strangely, legume trees flourish in nitrogen-rich tropical soils, where they're represented by hundreds of species. Yet, in the nitrogen-poor soils of boreal or temperate forests, nitrogen-fixing trees are not nearly as prevalent or long-lived. Therein lies the mystery, Hedin said. Ecologists would assume that in soil with very little nitrogen, a tree that produces its own would have a leg up over non-nitrogen fixing trees. Instead, nitrogen fixers in these environments are literally overshadowed by neighboring trees, while nitrogen fixers in tropical zones handily compete with other trees, Hedin said. To figure this out, Hedin and his co-authors used an evolutionary game theory model to analyze how nitrogen-fixing trees would fare in tropical and non-tropical forests that had been disturbed by fire, mudslides, hurricanes and other natural phenomena. Hedin worked with former Princeton postdoctoral research associates Efrat Sheffer, first author and now a principal investigator and senior lecturer at the Robert H. Smith Faculty of Agriculture, Hebrew University of Jerusalem, and Sarah Batterman, who also received her Ph.D. in ecology and evolutionary biology from Princeton in 2013 and is now a university academic fellow (tenure-track) and NERC Independent Research Fellow at the University of Leeds in the United Kingdom. Simon Levin, Princeton's George M. Moffett Professor of Biology and professor of ecology and evolutionary biology, also was a co-author. The researchers found that in tropical forests, nitrogen-fixing trees use their ability to provide a nutrient boost during early growth, but switch it off when soil nitrogen reaches high levels. This allows those trees to conserve the considerable energy that goes into nitrogen fixing and more ably compete for sunshine. On the other hand, because nitrogen levels in temperate and boreal forests do not recover as quickly, nitrogen fixers in these environments continually generate nitrogen. This taxes their growth while promoting the robustness of their neighbors. As a result, these trees do not last past the early stages of a forest's recovery, the researchers report. "Generally we think of plants as responding passively to their environment, but we found that they can in fact be quite strategic," Hedin said. "Our theory suggests that the distribution of nitrogen fixers across biomes, and the great success of fixers in tropical forests, is a result of the evolution of 'smart' plant strategies in tropical forests in particular. "Tropical nitrogen-fixing plants are smart enough to know when to use costly nitrogen fixation to compete with neighboring plants, and when to turn it off, as if they are sentient beings," he said. "Nitrogen fixers in non-tropical zones are initially super competitors but end up fueling their own demise. Because their fixation is not strategic in the long term, they spread nitrogen around to their neighbors and their neighbors overcome them." By ensuring their presence in tropical forests, legume trees thus substantially help determine the function, productivity and composition of the tropical biome, Hedin said. This is particularly relevant to tropical forests' ability to absorb atmospheric carbon and to serve as an important contributor to the planet's land-based carbon "sink," or carbon-storage capacity. A 2013 study published in the journal Nature by Hedin's research group reported that in the early years of a tropical forest's recovery, the presence of legume trees accelerated tree growth and carbon uptake. The quick early growth facilitated by nitrogen fixing allowed legume trees to absorb carbon at rates up to nine times faster than non-legume trees. Benjamin Houlton, an associate professor of terrestrial biogeochemistry at the University of California-Davis, said that the work "shows that it's possible to consider evolution at the scale of entire ecosystems and their functioning." Houlton, who was not involved in the work, wrote a commentary about it for Nature Plants in which he intimates that this research could contribute to the development of a "unifying theory for ecology" that explains how adaptations among individual species result in ecosystem-wide patterns. "The major advance is that this study uses the lens of evolution to understand patterns of nitrogen-fixing trees worldwide," Houlton said. "We still don't know how it all works in the field, but the theory offers a chance for experimental tests to advance the science substantially. This moves us closer to our search for an evolutionarily coherent theory for ecology." In relation to nitrogen-fixing trees specifically, the Princeton research raises questions of how these important plants will fare in the future and what the consequences will be for the forest carbon sink, Houlton said. Nitrogen fixers will have a crucial role in the removal of carbon dioxide from Earth's atmosphere, but humans are adding vast amounts of nitrogen to global ecosystems, largely via agriculture and fossil fuel combustion, he said. 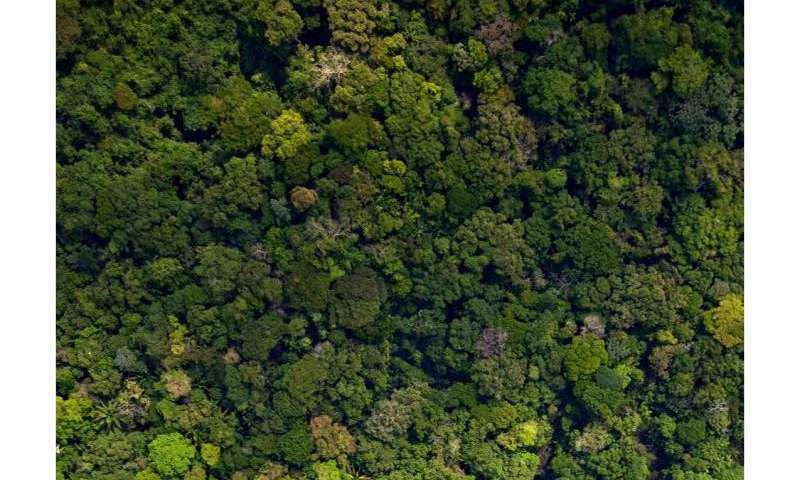 "If fixation works according to the [Princeton researchers'] theory, we might expect fixers in tropical forests to adjust to global change," Houlton said. "If nitrogen fixation can adjust, there's hope that entire ecosystem functions can maintain themselves in the face of global warming." Conversely, nitrogen-fixing trees in non-tropical areas could succumb to the onslaught of nitrogen because of their inability to compete with mature non-fixing trees, Houlton said. "The idea that some species have limited control over nitrogen fixation leaves them quite susceptible to a changing global environment," Houlton said. "The unprecedented amount of nitrogen circulating though the world's ecosystems is one of the largest impacts of humans on the planet. Will this added nitrogen remove nitrogen-fixing trees from temperate forests? The authors' study certainly shines a light on this future possibility." Nitrogen-fixing trees in boreal and temperate forests face additional pressure from humans, Sheffer said. The trees have evolved in accordance with the natural disturbances these forests face, particularly fire, she said. The work by her and her colleagues shows that after a disturbance nitrogen fixers "set the conditions" for the forest's regeneration, Sheffer said. Fire suppression and forest fragmentation, however, can restrict the distribution of non-tropical nitrogen fixers, which could affect forest recovery and health overall, Sheffer said. An additional consideration is that higher temperatures related to climate change could increase the decomposition by soil organisms, which would lead to a greater carbon content in the soils of boreal and temperate regions. More carbon would mean more nitrogen, thus removing the early advantage of nitrogen-fixing trees. "Our paper shows that different strategies of nitrogen fixation evolved in the different biomes to take advantage of the typical patterns of disturbance in each of these forest biomes well before there were so many man-made disturbances," Sheffer said. "Human activities are counteracting these evolutionary solutions," she said. "This could affect the global carbon budget if the regrowth of temperate and boreal forests is delayed due to a shortage of symbiotic nitrogen-fixing trees." The paper, "Biome-scale nitrogen fixation strategies selected by climatic constraints on nitrogen cycle," was published Nov. 23 by Nature Plants.